so our children can fly. This campaign will live long in history – thank you to all that are playing a part in it. Several weeks ago I wrote an atypically lyrical bit on Fall and my gardens. I love this season, and now I would like to pass on a bit more of the practical bits of what I have been up to – tucking my beds in for winter. My preferred method of soil stewardship is cover-cropping. Last year I used alot of straw in my home beds after reading Ruth Stout and Lee Reich and their deep mulch gardening. It worked very well – my garlic was essentially weed free for the entire season. And I will continue to use straw mulches on my permanent home beds. 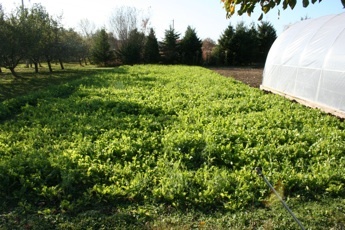 But out at the market garden I am using cover crops almost exclusively. 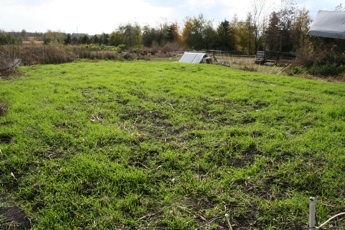 Above is a shot of a cover cropped field that had been in Garlic, and will be an early potato planting in 2009. This field still has a fair amount of perrenial weeds -primarily quack and thistle so leaving it bare is not an option if I am to turn the tide. Rye/Vetch is a great standby for both nitrogen and biomass, but I hope to plant this field in April -too early to let the vetch really fix nitrogen and the thick masses of rye roots decompose. So instead I wanted to put in a “winter kill” mix of annuals that would put on biomass in the fall, but be ready to plant in early spring. For this I choose a mix of 4 crops: Oilseed Radish (good root mass and nematode protection), Field Peas (nitrogen and cold resistance for late growth), Oats (biomass and root structure to outcompete weed roots) and Buckwheat (quick cover to let the peas and oats get going). This worked fabulously -the buckwheat sprang up quickly to shade and stunt the resprouting quack, only to be killed off in the first mild frost 3 weeks ago. This was timed perfectly to let the radish and field peas to shoot for the last vestiges of Fall Sun. Despite some 28 degree frosts, all crops are going strong, with only some minor frost burn on the radishes. The plot is a dense mat of greenery about a foot thick that will be killed off by Christmas to blanket the soil for the winter. Come spring it will be easy to till under or transplant through. On this years potato patch I did plant Rye and Hairy Vetch. This plot will hold melons in 2009 which matches very well. Melons and Squash will not be ready to plant until June, leaving plenty of time for the rye/vetch cover to be mown and begin to decompose. My hope is to plant directly through the rye stubble; if the mowing is timed correctly it will not resprout. Also, the decomposing rye is naturally allopathic (prevents weed germination) which will not inhibit transplants, and the thick mat of straw will help reduce damage to the growing fruits. That is the hope, we’ll see how it works. 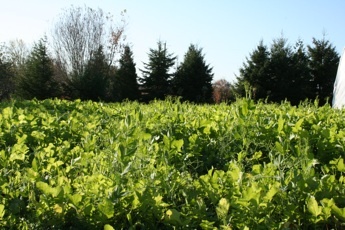 My choice to cover crop on the larger market gardens was made for a variety of reasons. First, there are some very real practical ones – laying out a 4″ thick mat of straw takes alot of straw. I don’t have a bale blower so labor would be extreme, and straw bales are going for $3.50 up here (none of it organic) and it would have been $200 to cover my beds, rather than $30 in seed. Secondly, I would rather not import 5000+ pounds of organic matter to the site if I can just grow it in place, cycling the nutrients in house as it were. Finally, from a soil ecosystem perspective, I like to have living roots in place as much as possible to foster the soil flora/fauna that I will need next year. Mulching works wonders on the soil as well – the soil under my garlic this year was incredibly light after the worm population exploded while feasting on the year old straw mulch. One hope next year is to grow my own mulches with a 3000 sq ft crop of sudan grass which can reach 4-6′ tall and produces several cutting annually. I tried this in 2008, but the resident chickens ate all the cover crop seed before it sprouted (I planted too early) so I will need rethink it a bit in 2009. The Sudan Grass mulch would cover my tomato and potato rows early in the season, and the later cuttings will blanket the Hoop House and other beds. Later this week I will post the 2008/9 picks of the Hoop House which has been moved and replanted. Stay tuned! In case you hadn’t heard the times, they are a changing. I just reread a piece I had written a few weeks ago at the beginning of the Economic Turmoil. Since then I, like all of us, have spent a lot of time talking to my co workers and neighbors about it. Those groups run the gamut from sound advice (don’t sell now!) to indifference to emotional reactions of rage and frustration. Very few people are doing anything other than a few tightening up their belts. I contrast that with what happens when I talk to my sustainability minded friends. They still have the rage -actually alot more- but dammit many of us are getting busy. And we really don’t even realize it. First clue was last week at my first Community Supported Energy (CSE) meeting. We’ve talked about this for a year now, and the simple act of calling it can be attributed to recent events, though I didn’t realize it at the time. I had expected 4 people and I got over 15, many of whom I didn’t know until then but had heard about it through friends -and these people are motivated and energetic. We reach consensus quickly and volunteers for action items are easy to find -very, very different than 3 months ago. The next clue was when I kept bumping into my farmer friend on odd corners of his land -we were tilling under fallow land and sowing cover crop like mad. Then a day later I started getting calls to hire my tractor to help other friends till more land under. Granted, my eco-peer group are a bunch of doers; 501C3’s and CSA’s don’t start themselves. But we are doing ALOT these days. Certainly there is some psychological coping mechanisms going on here -we feel helpless and are trying to just do something. But I also think it is more than that. We have spent the last 2 years in educating mode – getting the word out, holding study groups on The Natural Step, going to Village Meetings, and holding talks at conventions and rallies. Our group has put over 250 people through the study groups, and as we “train the trainers” we have contributed to another 500-750 more going through Natural Step training in SE Wisconsin. Our little group has seeded much larger areas like the Greater Milwaukee Area with Big Ideas. At MREA we talked to thousands and are still getting call backs, and have held breakouts at several other events. We have made real progress in Being The Change. But in the past month, I have heard less of us talking about educating – we have made a steady, inexorable change to spend our time doing. Without even discussing it, my farming mentor and I had decided to double our tilled land -even if we don’t plant it this year we had both decided to get it under cover crop to start stunting the perennial weeds. We both have the strong suspicion that we may need those extra acres. The CSE project went from esoteric musings to talks about business plans and zoning in less than 2 weeks as the DOW tanked and Iceland neared bankruptcy. Talks of community sized root cellars began to happen as did shared conversations of harvestable stands of timber in our collective’s property. As Paulson was talking bailout, we had begun thinking in terms of “lifeboats” and directing resources accordingly. “Lifeboat” is a great term to describe what we are doing. Our guts are telling us the “ship” is sinking – we spent the last two years bailing and trying to patch the hull by building grassroots support and spreading skills in Systems Thinking like Permaculture and The Natural Step and the Earth Victory Garden. Now we are shifting resources to swinging the boats over to the side in case we need ot cut loose when the ship falters. We are actively building infrastructure to keep us afloat: Roots Cellars, Energy Production Systems, tillable acres of living soils, harvestable timber plots to be managed, partnerships with grain farmers to work in oilseed crops in their rotations. We put in for our first grant today from Google. For $2,000,000. That much would let us build a CSE in every county in Southern WI and run them for 3 years. Crazy -damn straight! But ideas that make alot less sense than this have gotten more money. If the ship stays afloat, even if only to falter to shore, all the time we put into our lifeboats will not be wasted. Root Cellars for year round eating of locally produced food, producing hundreds of thousands of gallons of fuel from local waste products while producing dozens of tons of fish protien make sense no matter what size boat you’re on. 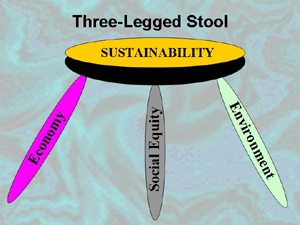 The Funnel is still closing, we are still using resources faster than they can be replenished – even if we stop the Economic Leg of the Sustainability Stool from wobbling, the other two need some serious help. I guess psychologically I am still in a twilight phase right now -but am hopeful enough still that it is dawn and not dusk. Or maybe I am somewhere between Billy Oceans “when the going gets tough, the tough get going” and Margaret Mead’s “never doubt that a small group of thoughtful, committed citizens can change the world; indeed, it’s the only thing that ever has” with a healthy dose of Emersonian “Self Reliance” thrown in for good measure. Americans are fantastic about rising to a challenge, we just need help seeing the challenge. This time I just hope it doesn’t take Pearl Harbor. My brain needed a break from technical books on ethanol and biodiesel production and the mail woman had just dropped of Lyle Estill’s Small is Possible which is only a few hundred pages of anecdotes so into the recliner I went. The book tells the dual story of one man’s (Estill) journey from Big to Small combined with a similar journey for the small community of Chatham County, North Carolina. I found both very interesting and was amazed (having never been to Ithaca, NY) that there was such a place. In the past decade Chatham has forged close ties with their community college and started a sustainability program, founded a local Food Co-op, a vibrant advocacy group, and even started a successful 1,000,000 gallon biodiesel social business that also acts as an incubator for local eco-businesses including greenhouse greens and organic farming on what was once a brown field. This is my dream for our Wisconsin Sustain Jefferson program. As inspiring as the community in the book is, (and trust me its got me fired up!) I found the story of Lyle the most intriguing. He is obviously incredibly gifted and was able to start from a level of financial success that I do not possess so on one hand he could be written off as a savant that others can’t compare to. But while he is certainly gifted and blessed, the most important attribute that he has is a lack of risk aversion. Seemingly a dozen times in the book he completely shifts careers and starts a new one -often from scratch as an entrepreneur. This is something I find almost incomprehensible. My father retired from a job he held for 30 years despite the opportunity to potentially make more going freelance because he choose stability for himself and his family. I have always respected that descision, and my 10 years with one company has alot to do with that. While I jump from project to project in my free time with reckless abandon, my work life is rock solid. It also provides very little meaning to my life (other than providing me with the base to do other things), but the paycheck is good and virtually gauranteed. But working for a Fortune 100 company whose mission is Feeding the Beast is not making the world a better place. It is NOT Being the Change. The counterpoint is that I only work 4 days a week which lets me farm part-time, and the good income allows me to buy $5000 hand tractors and build gasifiers and biodiesel processors on a whim. The amble vacation gives me flexibility to do presentations seemingly monthly around the state. It is safe, stable, and allows me to do Good in the world. But the more the World needs good, the more my 4-6 hours of weekly work Being the Change starts to feel like I am coming up short. Managing retail distribution feels (and is) pointless and shallow when you are staring down Peak Events in Food, Energy, and Population. I often ask Gary when he is going to abandon his commute, and his livelihood, and jump into Life’s Big Adventure — doing something that is infused with daily meaning. He plays with the idea. We need all the players we can get. This afternoon I have called a meeting to discuss my CSE proposal for our community. I need to learn more about what zoning, permits, etc will be needed, as well as get more input into the fundamentals of the idea: space, equipment and energy needs, time commitments and try to drum up addition support for people to actually make it a reality. My hope is to have a running prototype up by next fall in a dedicated structure… somewhere. If we can get a small scale one running, I feel we may be ready to pitch it Big – and shoot for a business that would dually support many of the needs of the community while providing employment for several people. Maybe then I will finally more fully commit to Life’s Big Adventure. Thanks for coming along for the ride! We had our first real frost this weekend which did in the squash and solancea. Much of our lettuce survived and we are still pulling potatoes (1400+ lbs!) out of the ground so the harvest continues for the 3rd month at 100#’s a week. The air is now crisp and fresh and the chores varied and more relaxed -pick a little, clear a bed, mulch one here, plant cover crop there-this is my favorite time of year. Autumn is a fantastic time, cherished by the ancients for its abundance – a season absoutely riddled with holidays and festivals to celebrate the vitality of the earth before the Long Sleep. The service this morning at our Unitarian Church focused on the Jewish High Holidays. I was deeply moved by the correlations between the passing of the Jewish New Year and my own mindset with the passing of the agricultural one. I too am thinking of things that went well in the past season – the potatoes were a raging success as was the Hoop House -seeds I hope to plant in the Great Book. I also reminisced about things to leave in the past – the onion rows swallowed beneath a Sea of Sedges, the fence rows intertwined with 6′ lambs quarter, and others -things that I hope to leave out of the future. But most of all I was struck by just how my thinking of this season has changed with my growing ecological awareness. Autumn was often seen as the passing of the year -a winding down, even a death, to the vibrancy of summer. Outdoor activity had often escalated -this is my preferred camping season -the nights are crisp & bug free for glorious sleeping, the understory is open, dry, and full of aroma, and the wildlife is on the move. It is still all of these things, but the more naturally I have learned to view the world, the more I think of the seasons as they are meant to -cyclical. Now the falling leaves that blanket the soil are also a call to me to mulch my gardens and spread the season’s compost for a final mellowing over winter on the soil. Where before there was death and decay, now there is abundance and the “putting by” of root crops, and even the rekindling of life as vetch and rye shoots forth before the end of the warm sun. It is now a time of new beginnings as the beds and fields are stripped bare with the harvest to the sweet melodies of flitting finches in the cupplants and raucous chippies under the oaks sharing my labors. Stretching to a longer harvest as my plantings have diversified has greatly increased my enjoyment of the seasons – Summer’s peppers and sauces and now wonderfully augmented by early Spring’s crisp, sweet, frost-kissed Spinach to late Spring’s romaines and now I am awed by the bounty of October’s butternuts, acorns, carrots, and kale. It is a bountiful harvest, with more to be planted as the Hoop House enters full circle with spinach and mache for another winters run. Stretching the harvest spreads the labors and greatly enriches the enjoyment of the tasks. No energy is so full as that which courses through my arms when I first put spade to soil in those early warm days of Spring, no air so warm and moist as walking through the Hoop House’s 75 degrees in January only to rejoice in the frigid cold as I leave with arms full of greens, and no air so crisp and alive as the fields of October as the flocks gather. Spreading the Harvest is to take part in the Glory of Nature varied seasons and what they have always meant. Turn…turn…turn; always and forever. While Spring and Summer are the seasons of food building, Autumn is now the Season of the Soil. The bounties of the harvest are coming in full, but time is now taken to Give Back. As Nature drops Her leaves and folds Her stems to blanket and feed the soil, so too must we give back to that which we have taken of so freely so that the cycle may begin again, enriched, for seasons to come. This must be our promise. On 10/1 Bernie Sanders of Vermont proposed the only ammendment that made any sense whatsoever for the “bailout” of Wall Street. In his speech which is long, but so packed with commonsense goodness, righteous rage, and patriotism that I implore you to watch it, that the top 1% of Americans pay for 45% of the bailout. That Top 1% ‘s income is greater than the COMBINED income of the bottom 50% (!!) and has accumulated wealth greater than the bottom 90%. Sweet Jesus. He proposed a 5 year 10% surtax on those that benifited most under Bush and the excessive greed fueled by the Republican Deregulation. His proposal was voted down 99:1. To anyone who doubted it: we are a democracy in name only. Long live the cleptocracy of the Oligarchs. And may God Himself help us because we can’t help ourselves. 99:1 and Caligula is calling!